Once Indra, the king of the devas, insulted his guru, Brihaspati, by ignoring him when the latter entered his court. On seeing this, Brihaspati decided that Indra should be taught a lesson; so he disappeared from Indra’s sight. Indra and other devas depended on Brihaspati to do the proper yagnas to keep them in their glory and to keep the asuras away from heaven. When Indra could not find his revered guru, he and the other devas grew weaker. The asuras, seizing the moment, attacked heaven and usurped Indra’s throne, sending the devas fleeing from their home. The devas, overjoyed, humbly went to Vishwarupa and said, “O great sage! You are our only refuge. 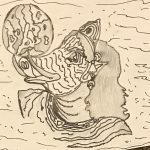 We have lost our home to the asuras. Kindly be our guru and guide us so we can attain our former glory.” Vishwarupa was a little reluctant to accept. But seeing the plight of the devas, he felt sorry for them and accepted their offer. With Vishwarupa doing the proper yagnas for them, the devas regained their former glory and won back heaven from the asuras. However, during the yagnas for the devas, whenever Vishwarupa poured ghee into the sacrificial fire to preserve the devas’ glory, he also secretly poured ghee for the asuras. He was related to the asuras on his mother’s side and hence he was sympathetic towards them. When Indra came to know of this act of Vishwarupa’s, Indra became very angry and immediately beheaded him. When Vishwarupa’s father, the great sage Tvashta, heard what happened to his beloved son, he decided to seek revenge on Indra. 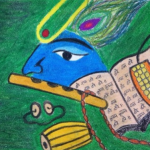 With his yogic powers, he created Vritrasura, a terrifying demon with fiery eyes and a lolling tongue. Even though Vritrasura had a terrible form, he was a great devotee of Sri Hari because of his previous birth. The devas then, approached sage Dadichi and asked for his backbone. Sage Dadichi, who was also a great devotee of Sri Hari, heartily said, “You can gladly take my backbone. This is all Hari’s will.” With that, the sage went into samadhi (state of oneness with God) and the devas obtained his backbone. They created the Vajrayudham (thunderbolt) with the backbone. 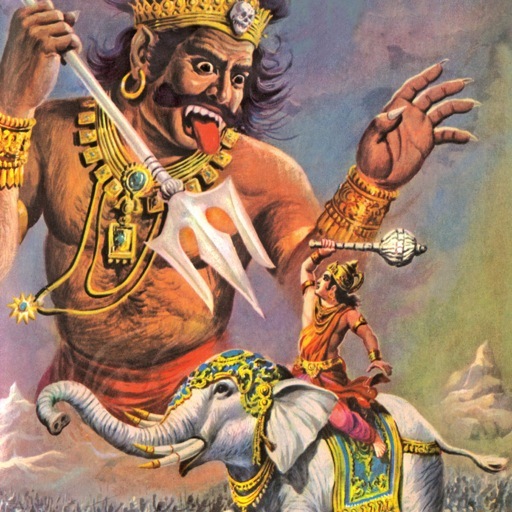 Indra lifted it up, and with a surge of confidence, charged into heaven on Airavata, his white, four-tusked elephant. Vritrasura, not a bit surprised by Indra’s entrance, gave him a terrible blow, which sent Airavata and Indra sprawling. Vritrasura then picked up Indra and gobbled him up. But Indra slashed his way out with his Vajrayudham. He then cut off Vritra’s right arm. 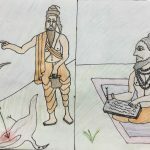 Vritra, knowing that he was going to die soon, called out with immense devotion to Sri Hari and said, “O Lord, I am waiting for you like a baby sparrow would wait for her mother, like a calf would wait for the cow, like the wife would wait for the husband!” He then addressed Indra and said, “O Indra! Strike me down so I can be reunited with my Lord.” And when Indra struck Vritrasura down, a bright light came from his body and merged with Sri Hari. 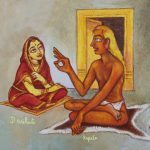 Thus, in this beautiful story, Sri Hari shows us how much he loves his devotees, no matter who they are.